MAUI, Hawaii - Sept. 21, 2018 - PRLog -- One of the smallest and fastest rising startups named Plotaverse, became a badged Facebook Marketing Partner. Plotaverse was created by a handful of artists, who managed to gain nearly 6 million downloads within the first year of releasing their new invention from beta. It is a first to market photo app suite, capable of adding fluently looping motion to any single still photo. 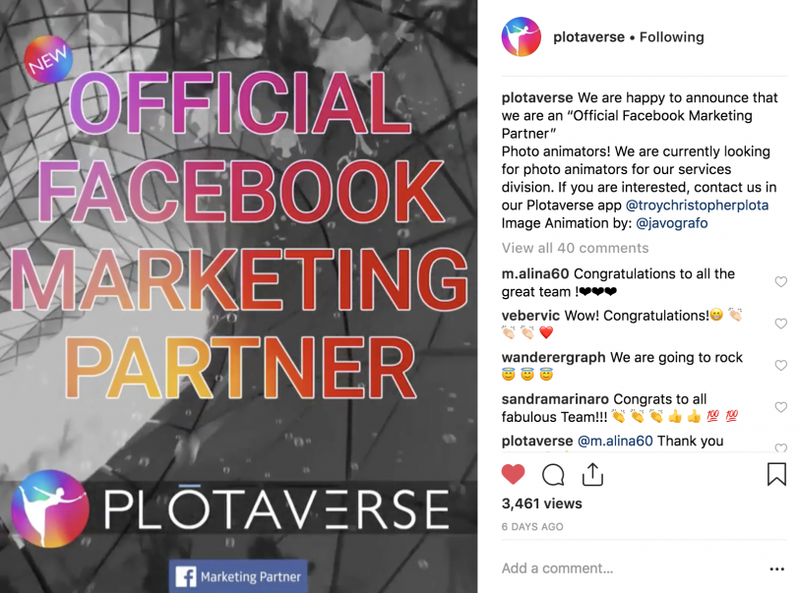 Photographs-turned-"Plotagraphs" display a never seen before animation effect, which catapulted Plotaverse among leading creative platform giants in Facebook's Marketing Partner league. Millions of social media surfers around the world have been captivated by hypnotizing Plotagraphs. Case studies have proven that Plotagraphs, posted on social media, consistently get 200% more engagement than all surrounding still content posts. The viral nature of Plotagraph's motion is used by industry superstars like Ariana Grande, Gary Vaynerchuck, Kim Kardashian, GoPro, Paris Hilton, Landrover, and Fall Out Boy. Brands and influencers have consistently doubled and tripled audience engagement by posting promotional Plotagraphs on Facebook and Instagram. In June of 2018, MarketWatch added Plotagraph Pro to this year's list of top animation "Product Innovations & Introductions". Plotaverse is named after co-founder, Troy Christopher Plota. Troy is a high fashion and advertising photographer for over 30 years, while also spearheading the forefront of technology. Troy recognized early on, that marketing and advertising mediums are rapidly turning digital, as opposed to print. "On a digital screen, audiences expect an image to move. Statistics are proving that videos get three times more engagement than stills. I had to find a solution for brands and creatives to quickly turn stills into looping videos that drive ROI." Troy's partner, 25 year old Plotaverse CEO and co-founder, Sascha Scheider, was recently listed top 99 "Limit Breaking" female founders by Thrive Global, and featured as "Female Disruptor" by Authority Magazine. Together they created the most advanced looping content platform in the marketing world, which is loved by hundreds of brands and millions of users.